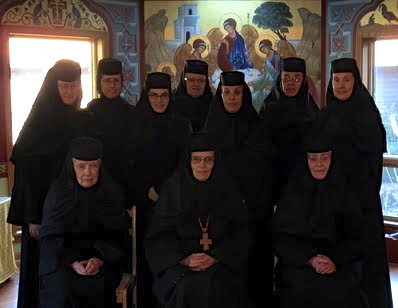 The nuns of the Orthodox Monastery of the Transfiguration here recently began a new ministry—live streaming and recording of chapel services for the elderly, ill, those away from home, and those who for other reasons are unable to attend services at their parish. The nuns broadcast select services—usually Vigils and Liturgies for Sundays and the Great Feasts, Vespers on two weekday evenings, and weekday Liturgies—many of which are then archived for future viewing. The ministry became a reality through a grant awarded by the Ganister Orthodox Foundation Fund at the First Community Foundation Partnership of Pennsylvania. “The grant funded hardware and software improvements to our online video streaming,” Mother Magdalena added. “Video quality is now streamed in high quality at 30fps rather than medium quality averaging 14fps. For a schedule of services visit the monastery’s web site at www.orthodoxmonasteryellwoodcity.org and click the “Online Chapel” tab, where links to live services and a YouTube archive of past services may be accessed. “We have received e-mails from persons around the world telling us how much they appreciate being able to join us in worship,” said Sister Helene, who oversees the monastery’s web site.